Police say this woman trashed a South Philly Dunkin' Donuts and threw a cup at a manager on Feb. 12, 2016. 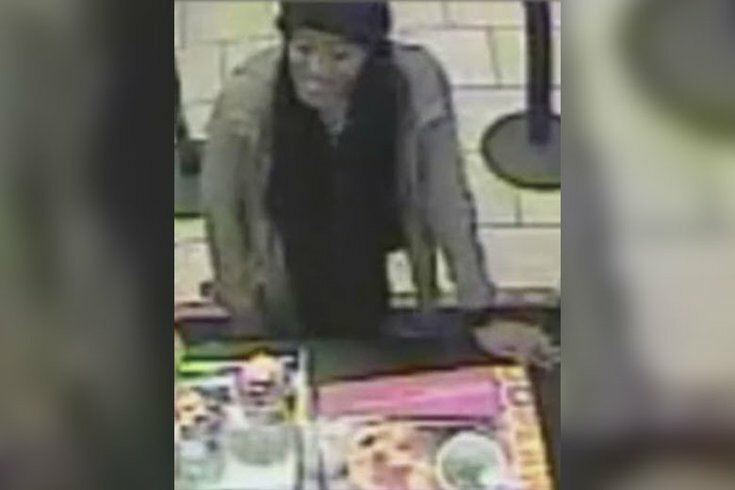 Police are seeking a woman who they say had a meltdown at the counter of a South Philly Dunkin’ Donuts, leaving a manager with a cut on her arm. Authorities say the unknown female suspect entered the coffee shop at 1551 Washington Ave. around 6:50 a.m. on Feb. 12 and placed an order. She became unhappy with the service, police say, and began knocking down items near the cash register. Then, she allegedly threw a ceramic cup filled with change for tips at the manager, leaving a laceration on her left wrist. The manager was taken to the hospital and treated for her injuries. The suspect left the store in a dark-colored vehicle, possibly a Ford Taurus, according to authorities. You can watch surveillance video of the incident below. The suspect is described as a black female in her early 20s, standing about 5'4" tall with a light brown complexion. She was wearing a black hat and a tan jacket. Anyone with information on the incident or the suspect is asked to call the South Detective Division at 215-686-3013/3014. Tips can also be placed by calling 215-686-8477 or by texting PPD TIP or 773847. All tips will remain confidential. If the suspect is spotted, police ask that you do not approach her and instead call 911.